You are here: Home / Featured / Victorian Horse Jewelry – On Sale! 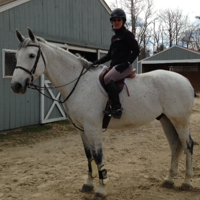 Vintage horse jewelry fans, this post is for you! We’ve taken a peek into the Sale Vault, and it turns out that there is some fantastic Victorian horse jewelry in there just waiting to find their right home. If you’re looking to build your horse jewelry collection or you need to get someone a fabulous Valentine’s Day present (less than 10 days until the big day!) you’ll want to keep reading. 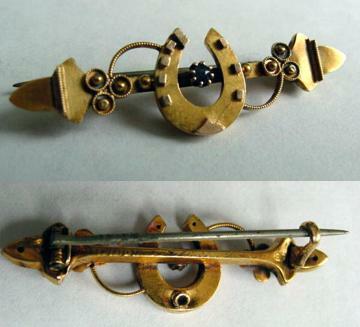 We’re starting with this Victorian 9ct Horseshoe Pin Brooch. This is an English piece – great for the Downton Abbey fans! – that has a small sapphire set in the middle. It’s got the rich gold luster that only time gives. Wearing this lovely gold horse brooch connects you with the generations of horse lovers who came before you. Currently available for $150 – this is a savings of $130! Check out this beautiful Victorian Rose Gold Horseshoe Bracelet. Ideal for the small wrist, this rose-gold filled bracelet features a center pearl in the middle of the lucky horseshoe motif. High quality antique workmanship that’s perfectly in step with today’s trends. You can wear this bracelet alone, or pair it with a horse charm bracelet or engraveable barn bangle bracelet for the popular stacked look. We like this bracelet especially because it is very well-made. It closes very securely with a click closure, and there’s a safety chain so you never need to worry about losing your bracelet. The workmanship is top quality: exquisitely detailed, this lovely bracelet will delight everyone who looks at it. Currently available for $225 – you save $165! Finally, you won’t want to miss this fantastic piece of Victorian Horse Jewelry. This Antique Horse and Horseshoe Watchchain Neckpiece marries a vintage Victorian horseshoe watch chain with a contemporary bold silver rolo necklace to create a completely wearable, one of a kind, statement piece of fine equestrian jewelry. We absolutely love this piece, but it’s time to let it go to its proper home. That’s why we’ve slashed the price by more than 50%! Save $435 on this necklace: you can get it today for only $390!